Starting in North Platte, NE, we headed back into Kansas, making it all the way down to Hays before lunch. Our play was the dry line in west Kansas and a boundary draped along I-70. After stopping in Hays for lunch, we headed west and dropped south out of WaKeeney, yes on the exact same roads we'd been driving up and down all tour. Leaving WaKeeney we saw clear evidence of wind damage caused either by the straight line winds associated with the RFD surge we got caught in, or the tornado itself on May 22nd. We headed for Ness City, but ended up turning West to intercept the first big supercell of the day. It was closest to the boundary, and I suspected that it would go bonkers once it got there. 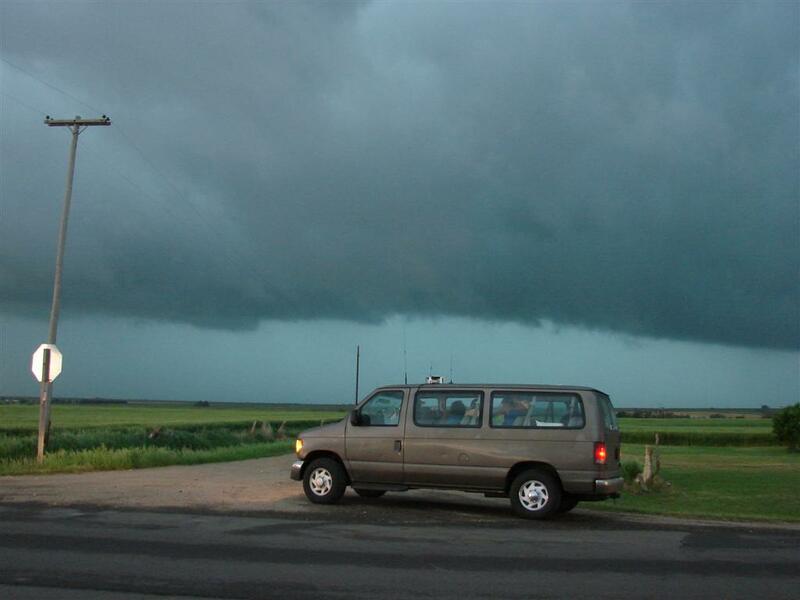 We barely beat the storm into Scott City and came around from the south while a wall cloud developed to our north. It looked for a bit like it could tornado, but lost focus as the storm moved off to the north and the storm fell apart. 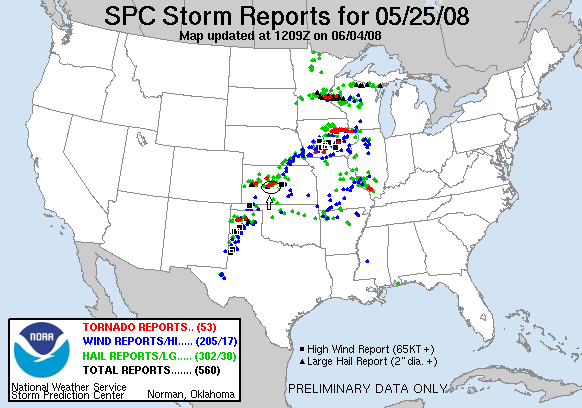 There was a large RFD kick up of dirt to our south around this time, and one of the rival storm chase tour companies reported it as a tornado, but it was certainly NOT. With that storm falling apart, we targeted the next storm down the line which looked much beefier and was in better air. The storm was already tornado warned and there was a report of a tornado from the groups that were already on the storm. We made an easy intercept as the storm moved across the road right as we got there, so we were able to get into position around the south end of the storm without trouble. As we got there we immediately spotted a very large rotating wall cloud. We got right up to it as it spun wildly and were in the perfect spot if it had tornadoed, but sadly we didn't see it from our vantage. There was a report of a brief spin-up, but we didn’t see it. This occurred west of Alexander. As that wall cloud fell apart, a second cell had crashed into our storm and soon developed its own wall cloud just east of Rush City. 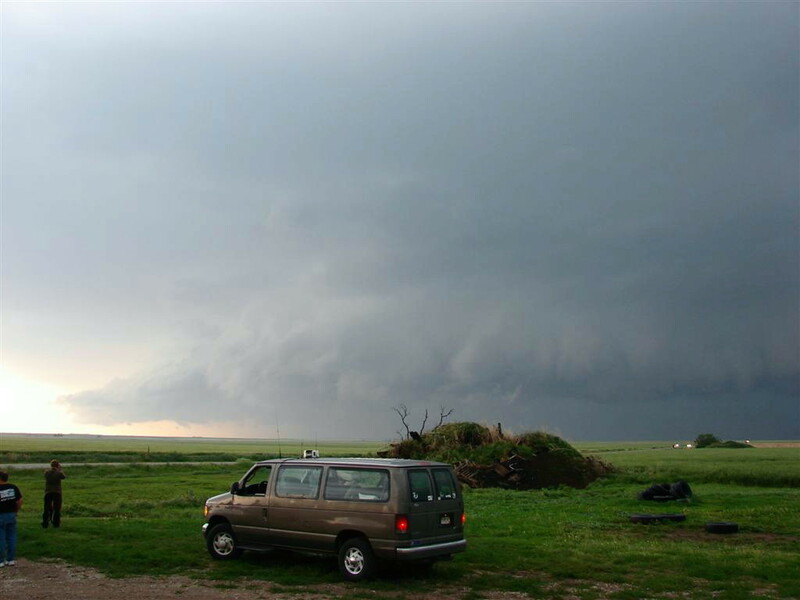 The wall cloud fell apart, and we proceeded east but just as we left our observation spot Andy noticed a white horizontal funnel running along side the vans and shortly there after the nose of the funnel dipped and a large debris cloud formed less than 1/2 a mile from us! We quickly stopped and observed the tornado for a few minutes as the tornado sirens in Timken began to sound. It was a strange looking tornado, with a long kind of cork-screwed wall cloud. We eventually decided it was a landspout. 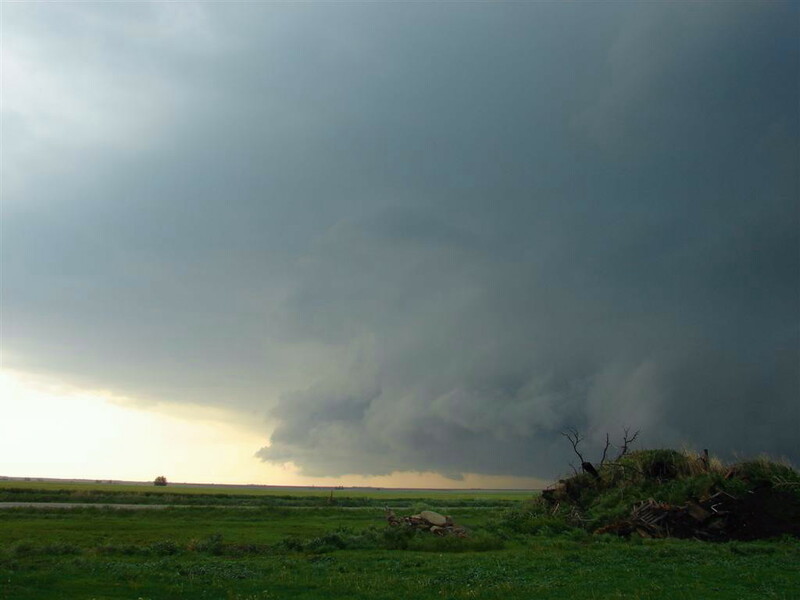 We then followed along as the wall cloud recycled, then charged north to see if it would tornado again, once again getting a wild ride on muddy gravel roads through Otis and Galatia. Once we arrived in Galatia, the storm had died and the next storm in line had become a big HP, so we watched for about 20 minutes as a nice shelf cloud zoomed forward towards us. Finally we gave up and headed to Hoisington to refuel and keep an eye towards the south to see if anything would come together, but by now the storms had merged into a very long linear MCS and the tornado threat was over. We called it a night and went to the hotel in Salina, KS. A very interesting chase day with a lot of neat cloud structure, of course topped off by a very close landspout tornado. The only thing separating the day from a big tornado day in Kansas was the lack of backed surface wind. At this point we’d seen at least 7 tornadoes all within about 50 miles of each other on 3 separate days. After chasing a storm near Ness City, we blast east towards a strong storm near Alexander. as we pass south of the storm, a funnel extends about 1/2 way to the ground. Now stopped, we observe this large soda-can wall cloud spinning like a top just to our north. There was a brief spin up reported with this storm, but we didn't see it from where we were. 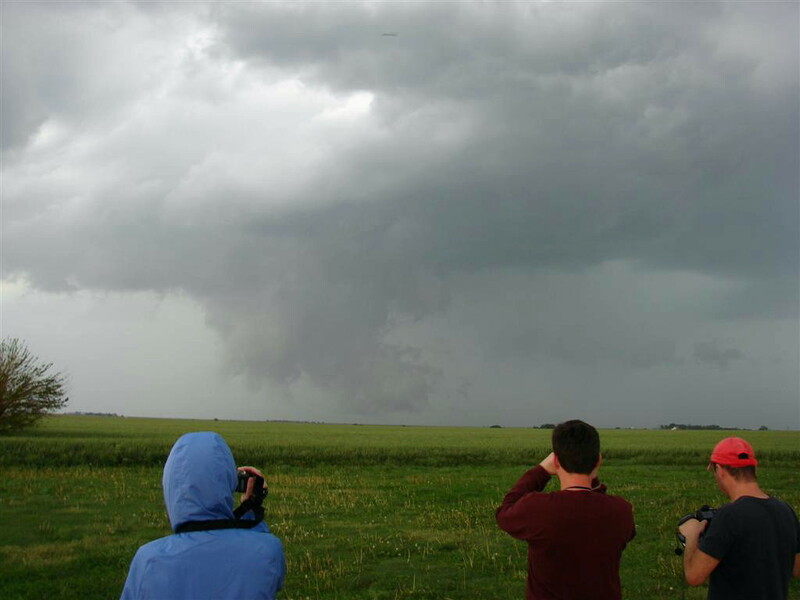 A bit later Andy (one of the other guides) notices a horizontal funnel cloud developing just north of the vans and moments later, landspout tornado! 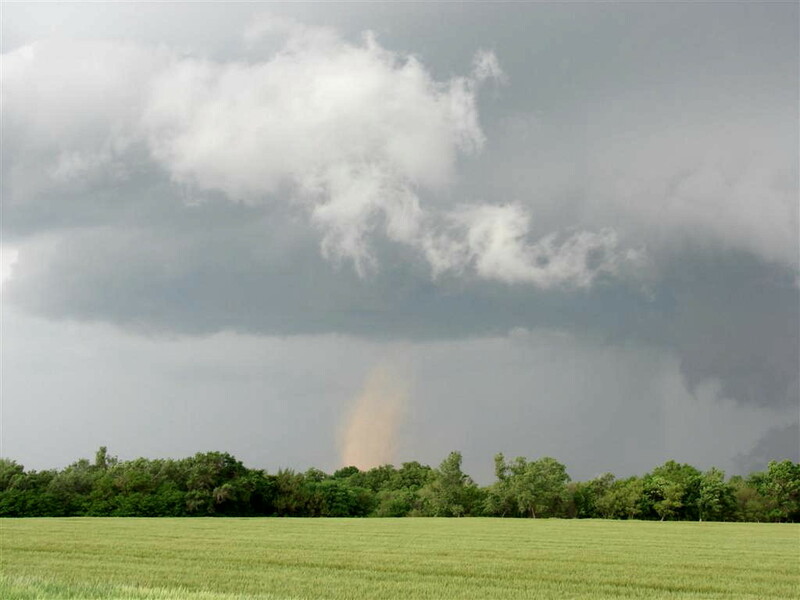 The funnel enters the picture from the top left, extends to about the middle of the picture, then bends downwards over the tan debris cloud the tornado caused. We get back on the storm as a new wall cloud cycles farther east towards Otis. The storm, alas, becomes high precipitation, pretty much ending the tornado threat. Here is the approaching shelf cloud. We pause to take one more look near twilight with the blue-green glow of the hail core is off to our west.